I really like reading this one,,and am looking forward to the other 2 in the series..I have always liked Susan Carroll. I would recommend reading her books to anyone who likes historical fiction with a little magic in it..
Just finished the first two books in Colleen Coble's series Mercy Falls. Really enjoyed both. Reviews are being posted! Fun! Found this thru The Fourth Musketeer. Sounds swell but when we are speaking of any historical fiction, can this apply to elementary age chapter books set in the past. Got my first review posted! Yay! Hi All. Just posted my review of Panther in the Sky, by James Alexander Thom, over at Past Perfect blog. Just finished Kathleen Kent's Wolves of Andover - quite a disappointment unfortunately. I loved her first book. Just posted a review of Darcy's Voyage by Kara Louise, a very enjoyable retelling of Pride and Prejudice. Have completed my first historical fiction novel of the year - Devil's Brood by Sharon Kay Penman - and have posted a review on my blog. What happened to the alphabet challenge? I can't find letter X, which should have appeared Jan. 1? Review up, book #1 for 2011 was a serious dud. Apparently I can't type today, LOL! 1st book for this challenge was a re-read of Jane and the Unpleasantness at Scargrave Manor by Stephanie Barron. This past week I read The Toll-Gate by Georgette Heyer and Young Master Darcy by Pamela Aidan. Next up is I Was Jane Austen's Best Friend. I'm afflicted with more than severe bookaholism! Just posted my review of India Black on my blog. It was a wonderful fast paced novel and I highly recommend it. - the second in the historical mystery series set in Tudor England (1540s London). When a favorite author of mine (Susanna Kearsley) wrote an article on her blog about one of her favorite authors that influenced her writing (Jan Cox Speas), I had to check out the recommended books. Bride of the MacHugh was more historical fiction than historical romance, so don't let the cover put you off. You can definitely see similarities in the way both authors craft a story with vivid historical details and subtle romance. I plan on reading two more books by Jan Cox Speas. I'm also giving the book away if anyone is interested. Good luck to those who enter! My review of Russian Winter by Daphne Kalotay has been posted. Great book! Just wrote about Sandra Mitchell's The Vespertine, which I *loved*. I loved her first book, I'm a sucker for Spiritualism stories as well as Gothics, so there's really no surprise there! I just posted my link for my review of "The Masque of the Black Tulip" which is actually the third historical I have read this month so far. The other two were reviewed earlier on my blog--"The Exile" by Diana Gabaldon (a graphic novel) and "The Secret History of the Pink Carnation" (the first of the Lauren Willig spy series of which "Masque" is second). Somehow missed leaving a comment when I added last week's review. Oh, well. I just put up my review of Andre Norton's Civil War novel Ride Proud, Rebel! - last week's was Tiger Eye, a Western by B.M. Bower. We Hear the Dead, a fictionalized accound of the Fox sisters story. More spiritualism! Love that movement, for some reason. Just so fascinating. I just finished my second historical fiction book of the year, Displaced Persons by Ghita Schwarz. I have reviewed two historical fantasies: Daughter of the Forest and Son of the Shadows. My first two challenge reviews are up. Thanks for this challenge-- for the opportunity to see what other HF fans are reading and thinking! I love historical fiction so this challenge looks like a lot of fun! I will have my first review up soon! 9-13)Jane and the Unpleasantness at Scargrave Manor, Jane and the Man of the Cloth, Jane and the Stillroom Maid, Jane and the Genius of the Place, and Jane and the Wandering Eye, all by Stephanie Barron. Maybe you should have separate categories for those of us who don't have review blogs- we can read a lot faster when we don't have to write a review, although I am keeping my books, ratings and comments on Goodreads to keep track. Damn...I botched my link - The Distant Hours leads to Naked Cruelty. Sorry! 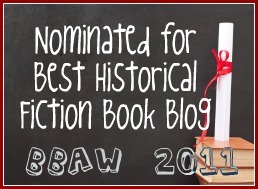 Do you not have a post for February Reviews of the Historical Fiction Challenge? Yes, I am also ready to post a February link. Does anyone know when a February post is being set up? I'm re-linking my January reviews again today, after already posting in January...apparently they were lost. Kim, the February review link is in the right-hand sidebar under the HF Challenge Logo. My two titles for January were read in January, but I did not review them until March 1st (I know...darn procrastinator!). I keep track of the dates I finish books in my planner. Anyway, both books are reviewed in the same post. Thanks! There is not forum for March, so I posted in January. I am a little behind on my historical fiction reading, but I still should be fine to read 20 by December. I LOVED The Romeo and Juliet Code. I even wrote an e-mail to the author to tell her how much! Ugh, I posted this so late! But it still applies I hope! I have been very negligent to updating my blog these days! I blame it on the last semester of law school being an awful, awful time ... forgive? All 4 or 5 star reads! My first HF for the challenge was The Name of the Rose by Umberto Eco, and I gave it three stars on my review. I can't believe C. Pierson has read 13 already! Wow, impressive! I love Sara Poole's protagonist. She has a dark side which is a welcome relief from the usual female heroine. Highly recommended.